What Sports, And Time, Has Meant To Me (And You)…. I saw my first big league game at Crosley Field in 1962. I loved that old ballpark...and couldn't stand Riverfront Stadium when they moved in June of 1970. It slips up on you…time and the events that you either cherish or would as soon forget. Here’s part of my own list, and what I remember thinking when it happened. More often than not…I wasn’t even close to being right. If you have a good mind for anniversaries, here’s a personal list that I think you might appreciate…pertaining to my own life and last 50 years, and maybe yours. I won’t lie…most of them have something to do with sports, which is ironic, because while I clearly remember where I was when Mickey Mantle died on August 13, 1995 – I have trouble keeping track of family members and the dates on which they passed. And, I remember stuff like being at Riverfront Stadium on September 7, 1993, the night an obscure guy named Mark Whiten hit four home runs for the Cardinals against the Reds. But yet, I struggle with my own anniversary. That’s one nugget I try not to mention around home. 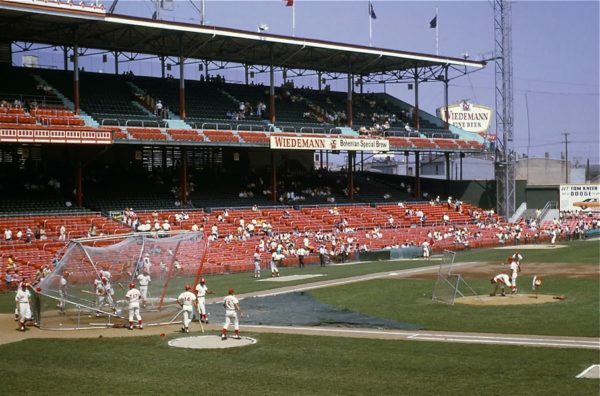 It’s been 48 years since the Reds left Crosley Field for the new Riverfront Stadium in June of 1970. Lord, I hated it. I loved Crosley because of so many childhood memories, like meeting Wally Post on May 6, 1962, my first major league baseball game. I hated Riverfront from the first time I laid eyes on it. Very ugly and impersonal. And at the time they were talking about Riverfront being state of the art. It wasn’t even close to some of the older parks, like Dodger Stadium. It’s also been 48 years since I played in the Ohio State marching band for the first time as a freshman, and at the time it was the biggest accomplishment of my life. The Buckeyes played Duke that day at Ohio Stadium and marching out for the pre-game entrance I swore I was going to soil myself in front of 94,000 people. A huge moment for a country kid from Lawrence County (Ironton) that grew up playing with a wooden whistle that my grandfather carved from a willow limb. 47 years ago I came within one out of pitching a no-hitter for the Buckeyes…and Paul Kurpiel caught the last out. He died last spring! 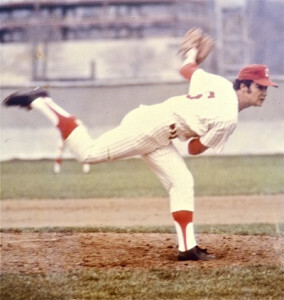 It’s been 47 years since I came within an out of pitching a no-hitter for the Ohio State Buckeyes in May of 1972. It was against Northwestern and the first batter of the game dropped down a bunt and beat it out for a hit. I retired the next 21 in a row on 74 pitches. We won, 5-0, and Paul Kurpiel caught the final out going over the wall in right field. ‘Kurpie’ died last spring! It’s been 43 years since I worked my first professional baseball game in the Gulf Coast League, in Bradenton Florida. Do I remember much about it? You bet. A giant hulking pitcher named Lee Smith pitched for the Cubs that day (and later saved 478 major league games)…and afterwards Ernie Banks (the Cubs farm director) came into the umpire dressing room to ask what I thought of him. ERNIE BANKS ASKED ME! Likewise, it’s been 43 years since Carlton Fisk hit the home run in Game 6 of the 1975 World Series. I was a Reds fan at the time and remember sitting home sweating bullets over every twist and turn in that Series. I still think it was one of the best ever. And if you look at Pete Rose and Johnny Bench today…how could they possibly be so old? Joe Morgan can barely walk. It’s been 32 years since my son Matt was born (this September 4th) and I carried him up the steps and into the house for the first time. We were living in Dean and Frona Pond’s house at the time, on Perry Road in Covington, and I still think of that moment now…when I walk up those steps to visit. ML Dunn has moved…check out their new location on National Road, in Englewood. It’s been 29 years since Pete Rose was banned from baseball, and at the time I really believed that Pete would worm his way back in. Bart Giamotti had other ideas. And since then…well, who needs reminding of what Pete Rose has become? He once kicked field goals for Covington. Now my son Matt catches waves in the Pacific. It’s now been 28 years since the Reds last won a World Series, in 1990, and the longest success drought in their modern history. I thought they’d win a bunch more with the talent they had on that team. But no, they tore it apart and the Reds have been the ‘Deads’ pretty much since then. I agree with Hal McCoy when he says…he won’t live long enough to see them play in another World Series. Neither will I.
It’s been 16 years since I watched Matt kick field goals in high school football, and I remember thinking at the time…geez, I just carried him home. It was right about then that I started feeling older. Now he surfs every day in the Pacific Ocean. It’s been 12 years now since I watched Piqua win its one and only state championship in high school football on a cold, windy night in Massillon’s Paul Brown Stadium. They played Pickerington and Brandon Saine had a phenomenal game. I also remember the fake punt that Bill Nees called that flipped the momentum of the game to Piqua’s favor. To this day I think that was the biggest event in the history of Piqua. And the irony is…somehow they win titles every year at Marion Local. But it’s hard to imagine 2006 again in Piqua. It’s been 9 years now since we launched Press Pros Magazine on August 10, 2010. I think my family thought it was a novelty at the time, and agreed to put up with me doing it. Now, it consumes my every waking, and sleeping, moment. It’s not so novel now. And I’ve typed enough to have written several novels in the last nine years. 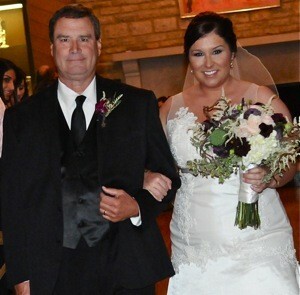 Very cool moment…walking my daughter Laynie down the aisle at her wedding. It’s been 7 years since my dad passed away in May of 2011. I still struggle with that, not only for the fact of his being gone, but for so many things I wish we could have resolved before he left. It’s been 4 years since I walked my daughter Laynie down the aisle for her wedding, October 10, 2014 – a very cool moment! Now here’s how I get in trouble. I also remember that night because I missed writing the Marion Local-Coldwater football game. Marion Local won the game 20-0, and I remember someone telling me the 50-50 was $10,000. I try not to bring that up on her anniversary. And in the last year I’ve said goodbye to four friends and associates forever, and a relationship that I thought would last for as long as I would. Not even close. Time and change will surely show…you know?